If you are needing a new dishwasher or other kitchen appliances now is the time to buy as Labor day weekend sales are here. My dishwasher broke a week ago so being a saver I wanted the best deal. I found a Samsung dishwasher at Lowes http://www.lowes.com/pd_332886-149-DMT400RHS_4294857924__?productId=3294740&Ns=p_product_qty_sales_dollar|1 for $539.10 marked down from $699.00,but that was not the price I paid. The deal gets better,I had a 10% off coupon(you can get these from the post office in the change of address books) and found a rebate for $125.0 .http://site.us-appliance.com/pdfs/samsung125_aug27.pdf . That made my price $360.20 almost half the price. 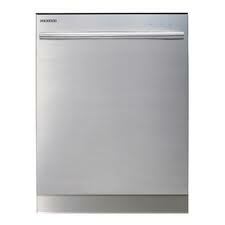 This is a nice dishwasher,all stainless steel inside and out. My dishwasher also had free delivery. I can't wait for my husband to install it as washing dishes by hand is no fun. 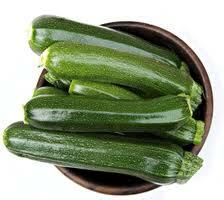 Both of these recipes are wonderful ways to use zucchini and you can't even tell there is zucchini in them. Here are some links to get some yummy ideas for dinner. Between pieces of plastic wrap or waxed paper, place each chicken breast smooth side down; gently pound with flat side of meat mallet or rolling pin until about 1/2 inch thick. In small shallow dish, mix flour with 1 teaspoon salt and 1/2 teaspoon pepper; dip each chicken breast into flour mixture, coating all sides.In 10-inch skillet, heat 2 tablespoons vegetable oil over medium-high heat. 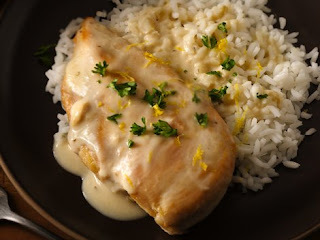 Cook chicken breasts in oil 6 to 8 minutes, turning once, or until brown. In small bowl, mix cooking sauce and lemon juice. Pour sauce mixture over chicken. Reduce heat to medium-low; simmer 5 to 10 minutes or until juice of chicken is clear when center of thickest part is cut (at least 165°F). Sprinkle with parsley and lemon peel. Serve with rice. It was simple to make and I loved that it did not have too many ingredients. Heat oven to 400°F. Line cookie sheet with foil; spray with cooking spray. Between pieces of plastic wrap or waxed paper, place each chicken breast smooth side down; gently pound with flat side of meat mallet or rolling pin until about 1/2 inch thick. Sprinkle chicken with salt and pepper to taste. In shallow dish, mix butter, 3 tablespoons of the cooking sauce and the garlic powder. 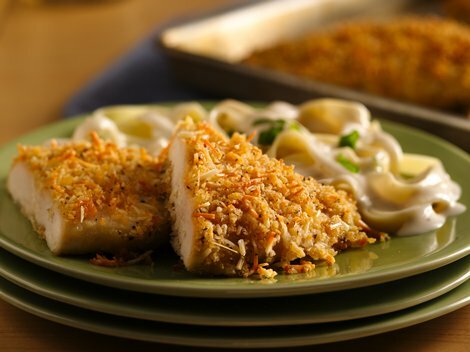 In another shallow dish, mix bread crumbs and cheese. Dip chicken into butter mixture, then dip into bread crumb mixture to coat. Place on cookie sheet. Bake 12 to 15 minutes, turning once, until juice of chicken is clear when center of thickest part is cut (at least 165°F) and coating is golden brown. Meanwhile, heat remaining sauce until hot. Serve chicken with pasta and sauce. Sprinkle with additional cheese and basil. My family enjoyed both meals and I liked how easy the recipes were to follow. I was able to serve chicken in a new way to my husband and he liked having something different for dinner. So try Progresso Recipe Starter Sauces tonight and your family will thank you. "These opinions are my own and Progresso provided me with the free product, information and gift pack through MyBlogSpark." Do Those Travel Sites Like Priceline Save You Money? I have been busy the last few days planning a trip to Great Lakes, Illinois for my sons Navy boot camp graduation. I love to save money so I checked out all the travel websites to buy my airline,hotel, and car rental. While those sites are great for one stop shopping,they really don't save you money. In fact some of them add on their fee and it costs more. The prices for air fare on sites like Price line,Expedia,and Hotwire to name a few are the same as buying on the airlines website. I found the best deal for hotels on the hotel's website,if I prepaid.The hotel site are great for finding your hotel,but once you do go to the hotel's website to see which site has a better deal. If I added my hotel and airfare together on the travel websites it actually cost me more. The only advantage I found was pairing up airfare and car rental on the travel sites. My car rental was cheaper for me that way. I was renting a mini van and car rental places never have any coupons for those. So it might be a better deal on the rental site,with a coupon,for a economy car. So how did I end up making all my reservations? I found the best deal on Hotwire pairing up my airfare and car rental together. I save about 50.00 that way. I reserved my hotel directly at the hotels website for the best deal. You may love hunting for the best deal so try my way or you may want the easy way so use the travel websites. I am back from my trip and have more advice on those travel sites. I feel it was not worth the 50.00 savings to use Hotwire for travel. Since we booked our plane tickets with them we were not able to choose our seats,we got stuck on the back of the plane both ways. Returing from our trip they were not able to sit all 6 of us together. We did have the little ones next to us but the older kids had to sit away from us and not even together. Next trip I make I will buy my plane tickets directly from the airlines so I can choose my seats. If we need to rent a car I will search for a coupon and book with the car rental place. Also I will look and see what the type of plane we will be flying on,as we were on a smaller one. We did not have any in flight movie or snacks. I feel safer and more comfortable on bigger planes. Here in Albuquerque,New Mexico I think our houses are built on a big ant nest. No matter how clean you keep your house,the ants come in. Every summer I dread ants. I go to bed and wake up to ants,sometimes in my kitchen and other times somewhere else in the house. I have tried many different sprays to get rid of the ants but they only work for a short time. I discovered a new product called Combat Source Kill Max Ant Gel and Baits. Unlike sprays that kill only the ants it sprays Combat Source Kill Max has a chemical called Fipronila fast-acting active ingredient that's speed is still slow enough for the ants to ingest it and take it back to the colony to feed to all the ants including the queen. The entire colony is killed. That means no more ants. The baits are great for places where ants like to visit like under the sink. You simply place the gel near ant trails and the ants take it back to all the ants. This stuff works! The other day I woke up to ants on my counter. I follow the trail and it was on the top of the door frame. I put some of the gel there and tons of ants came out to eat the gel. I have not seen the ants since then. Combat is having a Contest of their own. They are giving one lucky winner $1000 to hold their own "bug free backyard bash." To enter go t0 Bug Free Backyard BashThe winner will also receive an assortment of Combat brand product to ensure ants don't spoil the Bash. Be sure to enter that fun contest. Good luck to all. Combat is also letting me give away one box of the Combat Source Kill Max Ant Gel to one lucky winner of my blog. Just look on the rafflecopter form to enter. 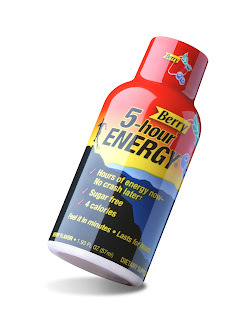 The key ingredients in 5-hour ENERGY® are also available in every day foods. It contains zero sugar, zero herbal stimulants, and four calories. It also contains about as much caffeine as a cup of the leading premium coffee. I received a sample of the product from Smiley360 and the opinions are my own. I was given a sample of this new sweetener made by Splenda. These are the facts about the sweetener. NECTRESSE™ Sweetener has the rich taste of sugar, but without all the calories, making it ideal for anyone who wants to reduce the calories from sugar in their diet. Monk fruit is hand-picked in remote mountain regions and has been cultivated for hundreds of years. 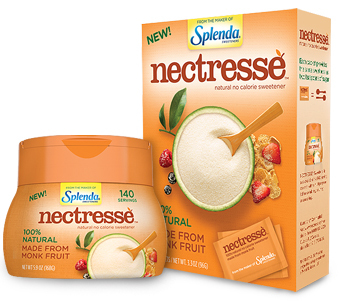 Each pack of NECTRESSE™ Sweetener provides all the sweetness of two teaspoons of sugar without all of the calories. NECTRESSE™ Sweetener does not include any gluten containing ingredients. I have four boys and they know how to entertain themselves most days. I am not one who buys the latest toys nor do we have a video game system,so my boys are very creative. It was a hot day the other day and mom did not feel like filling up the kiddie pool. My boys went outside and decided to play with the sprinkler. Of course that is fun in itself,but not for my boys. The one of the older boy who is 12 wanted to make a fun ride for the younger 4 and 5 year old boys. I thought this was pretty cool! He wrapped the hose around the swing set and attached the sprinkler. As my younger boys said "this is cooler than the water park!" This is a cool bowl and spoon set made by Nuby products. It is great for taking food for your child when you are on the go. You simply place the food like cereal in the bowl and snap and the lid that seals tightly to prevent spills. The lid also had a snap on feature to store the included spoon. It makes it easy to take some food with for later in your diaper bag. The product is made of break resistant plastic and is microwavable/dishwasher safe. On the bottom of the bowl there is a suction cup so the bowl won't fall off the table. This prevents a bowl of cereal and milk from going all over the floor. That means one less mess for mom to clean up. These opinions are my own and I was given the product to review as part of being a Nuby Mommy Blogger. I was given an opportunity to try a Nuby Snack Keeper and as with all Nuby products I loved the bright colors. I love the Snack keeper for being a container for mess-free snacks. The container holds 9 ounces of a dry snack like cheese crackers or cereal. The soft flaps make it easy for your little one to get a snack without making a mess. The top of the container comes off to put the snack in and while it is easy for mom to take it off,it is not for your little one. The Nuby Snack Keeper is also dishwasher safe as we moms are too busy to wash dishes. My little one enjoys using his Snack Keeper as it is fun to use and I love that it is mess free. If he tips it over the crackers stay inside. Here he is showing what is inside his Nuby Snack Keeper. These opinions are my own. I was given the product to review as part of the Nuby Mommy blogger program. We came home the other day from grandma and grandpa's,Jesse had fallen asleep in the car. He walked into the house and decided this was a good place to finish his nap. He just did not have the energy to make it to the couch. I love how he can sleep anywhere. When I first saw this snack keeper,I knew I had to have it for my boys. My boys love the movie Monsters Inc. and watch it a least once a week. I thought this cute snack keeper would be great for their snacks. When we received it,the boys were excited and said "cool,I want that!" Below is one of my boys holding the iMonster Snack Keeper. I love this snack keeper not only for it's cuteness but for how it works. You fill the keeper with snacks and your little one gets to stick their hand into the monsters mouth to get a snack. What little child won't think that is fun. Moms will love that the snacks will not fall out and make a mess as the soft silicone flaps keep the food inside. This iMonster Snack Keeper is also dishwasher safe and retains it's bright colors. I have washed it several times in my dishwasher and it still looks wonderful. The Nuby iMonster Snack Keeper makes snack time fun for little ones and less messy for mom. You can find this wonderful Nuby product and others at Burlington Coat Factory or online at www.amazon.com and www.buybabydirect.com. These opinions are my own. I was given this product to test from Nuby as I am a Nuby Mommy Blogger. Backpacks, Binders, BOOGIE WIPES, Oh-My! 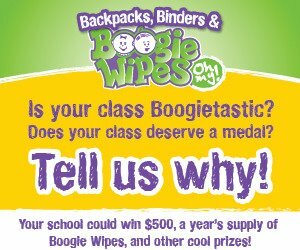 Does your child think their class is Boogietastic? Click the link below to learn more about this exciting contest. Those who enter could win $500 and other cool prizes for their entire class!